Here's some of my official Marvel art, I did a lot of the promotional art for the movie that you might see on toy packaging, merchandise and things like that. It was such an honor to do it because I was already so excited for the movie! I had to stray from my style try and match theirs, it was a real challenge but got there in the end. Marvel is lucky to have you. These are great! So judging by those shoes was she a ballet dancer? I love this costume, especially with how it handles negative space. The ballet shoes bother me a bit since they're the only blue in her suit but they're so small that most of the time, I don't notice them. 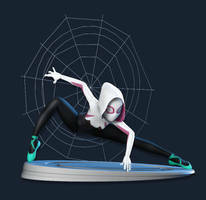 Great work, good to see Spider-Gwen on the big screen. Does she wear ballet slippers? I never noticed! Not to my knowledge. I think its just the way they designed her costume in the verse movie. More's the pity as with the ballet training and her spider powers would have made her a sight to behold. Looks really epic, love the pose! Did she wear ballerina shoes in the comics? No. She wore something more between blue sneakers and flat foot slip ons that was attached to her costume. This is a design choice by Sony animators. They are, but in the trailer she lands toe first on a tree branch after a jump. Healing factor or no, that's dropping 130 lbs on her toes. That's gotta hurt. 130 lbs multiplied by her velocity, unless my high school level science fails me. But it looked cool, so we'll let science take a backseat on this one. Many times for comic and animated heroes the powers and feats can get overboard one issue then next issue trouble lifting a light box inconsistent for many heroes plus when other writers come in the powers once more goes in many directions on how they are presented. All aboard the hype train ! I can't wait to see the movie ! I'm suddenly just realizing her shoes look like Ballet slippers.